John Cena and WWE have won the Mashable Awards In a 2011 International CFS Convention on the Jan 6 in Las Vegas.John Cena was voted as the 'Most Influential Social Good Champion". 'Stand Up for WWE' won the Most Creative Social Media Campaign category. 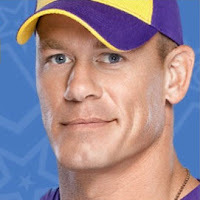 With over 1.3 million votes casted both WWE and John Cena were amongst the winners, along them were Google Android mobile operatiing system,Twitter and Apple's iPhone,Mashable readers, you spoke loud and clear, voting five strong nominees as finalists for the category: UnCultured, John Cena, Hardly Normal, Chris Hughes and charitybuzz. Cena is actively involved in a variety of wish-giving and grief support charities including the Kids Wish Network and the Make-A-Wish Foundation.